Please bring your own eye protection and lunch.Hot and cold catering will be available. 12 places available, 10 places remaining. Your ticket is non refundable if cancelled within 60 days of the class , we can try and sell your space and if successful you will get a full refund. On the first day I would first show my signature bead " Woman with brain "
Students will learn to work with reactive glass and silver glass, a deep lentil press, fine copper wire, silver leaf, heat control and embedding a twisted copper wire into the bead. In the bead your bead you will see the intelligence of the lady, outside eye and mouth. Students can let their creativity run wild.The students also learn how to adjust the amount of glass correctly to the press. 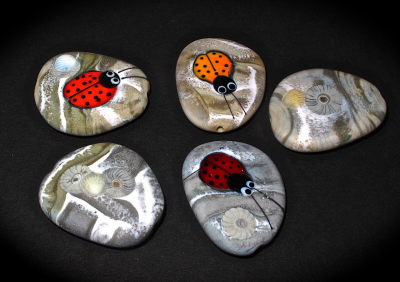 We will also learn how to set up the "spread out "rainbow murrini, learning how to make it and apply it.We will also make a "luckybead,"the technique of stone design with ladybug, hedgehog and mushroom.